First of all, if you have any preconceived notions about self-published books being inferior you should put them aside and read Darkhouse. Karina Halle can flat-out write a good story. 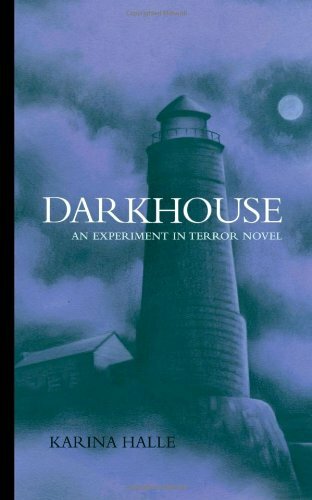 So what did I love so much about Darkhouse? Well, it certainly played into my addiction to those ridiculous tv ghost hunting shows. Shameful and ridiculous, yes, they are. But I watch them anyway. All of them. Even the one hosted by the dudebro with the hair and the too-tight t-shirts carefully chosen to show off his tribal-tatted biceps. Don’t judge me. Also, Halle’s writing is very vivid. She sets really detailed scenes. I’ve never been to the Pacific Northwest but I could picture it clearly in my mind, from the waves breaking on the shore to the foggy water to the rickety old lighthouse. Many of these scenes she sets so well are CREEPY as hell. Total nightmare stuff, which I was reading alone in the dark and that turned out to be not such a good idea. I found myself getting genuinely wigged out, which is pretty rare. Overall the book flows so easily…I love, love, love books with short paragraphs (at least, the ebook had short paragraphs, not sure if the paperback is formatted differently). There is just something so pleasing about that format to me, it just makes for really easy reading. I also loved that Perry is a flawed heroine. She’s not a beauty queen to begin with, and she’s carrying around a few extra lbs. on top of that. She dresses like she never quite got over the grunge era. She’s stuck in a dead end job that is sucking the life out of her, but she can’t afford to lose. There’s no mention of how gorgeous she is, how charming, or how everyone just loves her. People are wary of her, even her own family. She’s weird and she’s average and she’s a breath of fresh air when it seems like every book you pick up these days has an ethereally beautiful main character. Look, I don’t have anything against beautiful people – truly – but it’s nice that us average folk get a kickass heroine to relate to every now and again instead of being relegated to a sidekick or a frenemy. I was less in love with Dex, but I think that was intentional. The dude is just kind of difficult to like at this point in the series. I suspect his background/attitude will be explored more in the next book. Wanna know something terrible and kind of gross? I actually snuck off to the bathroom at work a few times because I couldn’t stop reading this. I can’t remember the last time I did that. At this point my co-workers probably think I have either the world’s worst intestinal issues or a serious drug problem. To say that I’m looking forward to reading the rest of the series would be putting it mildly. Seriously, I can’t believe the ebook is only $.99 on Amazon. Don’t even think twice about buying it. Bonus points for the MST3K shout out! Girl! Get on this immediately, especially if you already have it! I feel so much better that I’m not the only bathroom sneaker, ha ha. I do it at home too, and I don’t even HAVE children! I’m a huge fan of this series. I have an ARC of Lying Season (book 4) on my shelf, waiting to be read and that cover is realllly creepy. I feel exactly the same way about Perry as you. She definitely stands out from the heroine pack and I love the fact that she isn’t over grunge! As for Dex, he is tricky. I adore him, I really do. But I’m constantly teetering between wanting to kiss him or punch him. You must read Red Fox soon. I loved it! It was funny and sooo trippy. Yes, I’m going to be fitting Red Fox in just as soon as I can. I have some stuff I promised to review and some that need to go back to the library that I have to get through first, but I’m so excited that there are more books in this series. I really like it and I’m totes going to be more open to self-published authors now. Another bathroom sneaker! We should form some kind of super secret club like Bathroom Readers Anonymous. And my god, I wish I had thought of that before I named this blog.